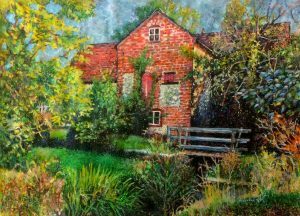 This painting of the old mill in Mill Lane, Chalgrove explores an idea I have played with for some time, mostly subconsciously, of whether buildings sit amongst trees or trees exist amongst buildings. I suppose it is simply a case of perspective but it explores the interface between manmade and natural which is given an even more opaque layer as a painting. I wanted to capture the shards of light that touched various angles of the building and tips of trees and vegetation. Alongside all of this a pigeon sits on the roof pondering life.